The Mazda 2 and the Suzuki Swift continue to be favourites with Australian consumers despite being two of the older members of the city car class. The duo accounts for one in four sales in the segment – impressive considering the pint-sized Mazda launched way back in 2007 and will be replaced by an all-new model early next year and the Suzuki, released in 2010, is also about halfway through its life. Key to their perennial popularity is the fact they’re two of the best cars available for under $20,000 with an automatic transmission – a crucial feature for clutch-shunning Aussies. The cheapest here is the Mazda 2 Maxx Sport, the top-grade variant in the recently rejigged two-tier line-up, which costs $18,580. The Suzuki Swift GL Navigator sits in the middle of its also newly revised three-model range, and asks almost $1K more at $19,490. The Swift has the equipment advantage to justify the extra outlay, however, uniquely offering a central touchscreen with satellite navigation and Bluetooth phone connectivity with audio streaming. The Mazda’s lack of Bluetooth is a disappointing omission for a car that targets tech-savvy teens and first-car buyers. The Mazda claws back ground with 15-inch alloy wheels and climate control (the Swift makes do with steel 15s and manual air conditioning), though the Suzuki also gets a driver’s knee airbag for seven in total (the Mazda gets six) and two extra speakers for its audio system, its six beating the 2’s four. Standard on both are fog lights, cruise control, trip computer, leather-wrapped steering wheel, CD player and a USB input – a good level of equipment for under $20K. The Suzuki is also the running costs king of this twin test. Both have six-month/10,000km service intervals, though over three years/60,000km the 2 costs $549 more to maintain ($1833 versus $1284). Based on their official combined cycle fuel consumption (Suzuki: 6.2 litres per 100km, Mazda: 6.8L/100km), the average annual mileage of 15,000km and an unleaded fuel price of $1.50 per litre, the Swift is also $135 cheaper to fuel per year. Three years of refuelling and servicing totals $6423 with the Mazda – almost $1K more than the Suzuki at $5469. Mazda offers a slightly better deal for high-mileage buyers, offering a three-year, unlimited-kilometre warranty – bettering Suzuki’s 100,000km cap over the same period. The city car pair is almost identical in size. The Mazda claims the most significant advantage in length and wheelbase, where it’s 50mm and 60mm longer at 3900mm and 2490mm respectively. Its 250-litre boot is also 40L larger, while both feature 60:40 split-fold rear seats for greater cargo-carrying flexibility. There’s less headroom for rear passengers in the Swift, meaning 180cm occupants will brush their heads on the roof liner where in the Mazda they’re just clear. But the Suzuki counters this by offering more toe room, a much softer seat base cushion and a less knees-up seating position. It’s also much more basic in the back of the Mazda, which misses out on the door-bin bottle holders, roof-mounted grab handles, reading lamp and passenger seat-back pocket standard in the Swift. Both cars have basic cabins that lack reach-adjustable steering wheels and soft-touch plastics. Red seat piping and stitching and a piano black dashboard give the updated 2 a sportier look than before. Its buttons and dials also feel nice to touch, and, while it sounds a little cliché, its doors sound and feel more solid when opened and closed compared with the flimsy-feeling Swift. The Suzuki’s layout is more mature, however, and its 6.1-inch colour touchscreen – which is intuitive to use, looks crisp, and provides good navigation guidance – gives it a big advantage over the older Mazda. As in the back, the Swift’s front seats are again more comfortable. Little splits the pair on paper under the bonnet, where both feature four-cylinder petrol engines and four-speed autos. 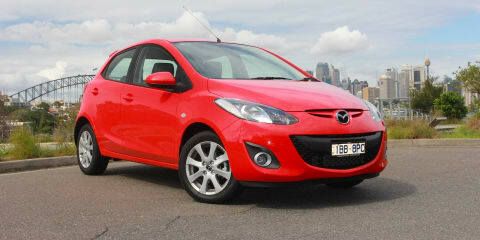 The Mazda 2’s 1.5-litre with 76kW of power and 135Nm of torque just pips the 1.4-litre Swift by 6kW and 5Nm. Both produce their peak figures at an identical 6000rpm and 4000rpm respectively. With just three kilograms between them (the Mazda lighter at 1032kg) there’s negligible difference in the way they perform. Both are lively enough off the line and at low speeds to feel competent around town, and provide more gradual acceleration at higher speeds. But it’s the Swift that feels a generation more advanced in terms of refinement. While both rev at roughly 3000rpm on the highway, the Mazda’s engine is much louder than the relaxed Swift. It’s the same story at lower speeds, too, and is particularly noticeable in the higher realms of the engines’ rev ranges, where the Mazda sounds like it’s working harder. While neither is especially quiet, the Swift also offers the best insulation from wind and road noise, with the 2 one of a long list of Mazdas guilty of below-average sound deadening. The pair’s four-speed automatics are ancient alongside rival city cars’ six- and seven-speed automatic and dual-clutch transmissions. Despite showing their age, the basic transmissions perform adequately in both cars, however, proving well behaved on the whole. The Swift’s ’box takes the points for being slightly more intuitive than the 2’s, dropping gears sooner around hills and holding them more consistently as required. The Mazda’s throttle response is good, and its transmission picks up lower gears with only a light increase in throttle pressure. The Swift has the more comfortable ride of the duo. Neither is especially smooth, though the Mazda’s firmer suspension means it jitters more than the Swift on seemingly smooth or slightly wrinkled roads. The Mazda feels more composed over large speed humps and potholes, though, where the Swift floats then bangs abruptly. The 2 is better over undulating roads too, soaking up irregularities rather than bouncing occupants around, though the Swift still feels the most absorbent. The stiffer Mazda handles better than the Suzuki, sitting flatter and feeling more settled in corners. The Swift is still nicely balanced, however, despite being softer. In a similar way, the 2’s steering feels sportier than the Swift’s, reacting instantly to small inputs either side of the centre position. It also transfers more vibrations from bumps in the road, however. The Swift’s steering suffers from some on-centre vacancy, though is nicely progressive as lock is applied, and less demanding to operate smoothly. Buyers prepared to stretch the budget beyond $20K should check out the Volkswagen Polo, Renault Clio and Ford Fiesta, which finished on the podium of our pricier city car comparison late last year. The Mazda 2 is raw, sporty, simple and cheap, and guaranteed to only get cheaper as the all-new model approaches. But for $910 more, the Suzuki Swift is better equipped and cheaper to run, as well as more comfortable, more refined and more mature, and the pick of this twin test.